As part of the on-going Penny Stamps lecture series, a partnership between the University of Michigan and the Urban Institute of Contemporary Arts, internationally-renowned sculptor and installation artist Ernesto Neto spoke at the UICA this past Wednesday. If you weren’t there, you missed a presentation by possibly the most one of charming contemporary artists. Brazilian artist Ernesto Neto greeted the audience at UICA last Wednesday by recounting the past 24 hours of his journey to Grand Rapids– the long, sleepless plane ride, the banana and granola bar he was offered on the plane, the pleasant Michigan weather that greeted him, and how he currently felt about being there. For Neto, this is not small talk. Because these mundane details affect his current state of being, they in turn affect how he engages others. He dismissed the idea of an “artist talk” being about telling the audience who you are. “I don’t know who I am,” Neto laughed, adding, “and that’s a good thing.” Identity, for Neto is an elusive notion, but one that is undeniably based on the encounters one has. This sensitive dance with which he approached the audience (and yes, those Brazilian hips did sway), that tenuous reciprocity between subject and viewer, is at the crux of his work. I might characterize Neto’s installations that I have experienced in recent years as playful, womblike spaces that compel you to shed inhibitions along with your shoes as you enter. As you find yourself immersed in cellular worlds of sagging biomorphic forms divided by stretchy translucent membranes, you are invited to poke fun at the human body, sometimes literally. The installations possess a buoyancy both in form and tone. But I would not have characterized his work as profoundly poetic, perhaps because, well, they’re so darn fun. It wasn’t until seeing the genesis of these forms in his early work that I recognized the profundity of this playfulness. I couldn’t find images of these works online, and since they’re so visually disparate from what the artist is doing now, I imagine this is intentional. 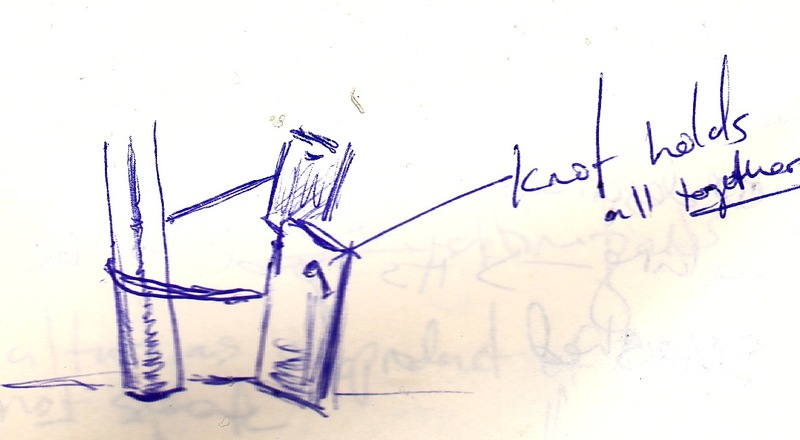 So, for the sake of documentation, please accept the drawings I scrawled during the lecture. In the spirit of minimalism, these early works combine elemental materials with matter-of-fact displays. The works act as sketches of larger, existential forces that are in flux. They deviate from minimalism in their lack of assertion. 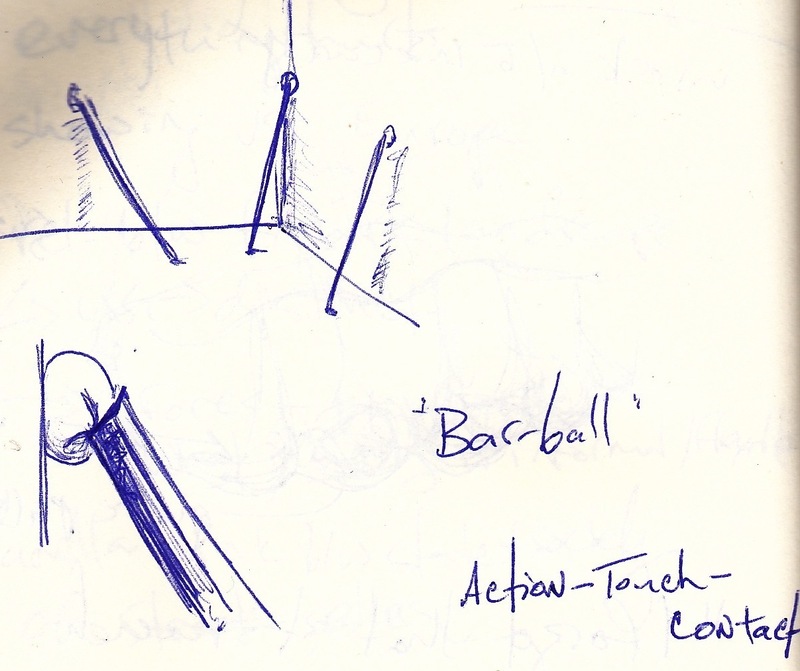 While Richard Serra’s steel beams seem to hail the harrowing force of gravity and perils of the constructed world, the steel beams of Neto’s “Ball Bar” also introduce an element of danger in the metal’s jabbing contact with the rubber ball. Although the ball here reminds us of our own fleshy vulnerability, the work celebrates a dependency represented in that squishy object whose resiliency absorbs what would otherwise be a gauging of the wall. There’s no such buffer in the world of masculine minimalism. In another early piece, two book-sized sheets of steel are held up by opposite gravitational forces. A simple rope threaded through the metal and wrapped around a pole connects the two. In a beautiful feminine gesture, one knot holds everything together. It was in these beginning gestures that I recognized the profoundness of Neto’s later works. Rather than seeing them as inviting jungle gyms—which, in light of last week’s heated conversation around ArtPrize calling art a “playground,” Neto’s installations might prove that perhaps this isn’t the worst thing to happen to art—I began to see in them a quiet acceptance of our inter-dependency and our fragile mortality. Ernesto Neto may have seduced the entire audience with his sing-song Portugese accent and South American swagger. (I actually heard a young woman tell her friend, “Now, I’m like, obsessed with the name, Ernesto.”) His work, on the other hand, is humble plea for your trust. His latest installation Anthropodino, opening next month in Chelsea’s Tanya Bonakdar Gallery, retains the elemental quality of those early works. Like those works, this monumental installation is also about insecurity—but on an experiential, and consequently, riskier scale. 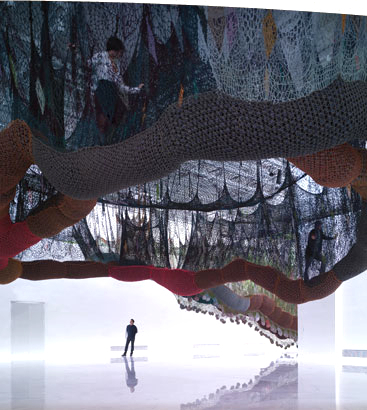 Vivid crocheted nets filled with spices and plastic balls form stalactites that hang from the ceiling, beckoning visitors to test their stability as they climb inside. Inside, I imagine you would wobble through this aromatic, swaying web, aware of your body’s shifting weight as well as the weight of other viewers who collectively affect the entire movement of the piece. As communal sites, Neto’s latest installations not only unify individuals but make participants keenly aware of the ripple affect of their actions. The lesson comes, though, not with a moral caution but a childlike invitation to play. While Mr. Neto was showing us this latest image, he turned from his laptop to face the projection behind him and exclaimed, “Wow! It’s huge. I always forget how much bigger it is for you.” While he may have been speaking about projected image, his remark seemed a fitting conclusion for an artist who is not only blasé about amount of sheer effort his pieces demand but whose work’s completion depends on those who test its strength. Yes – seduction! 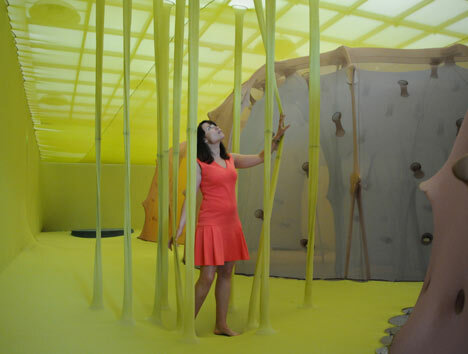 With his abundant charm and his being-here-now attendance, Ernesto Neto took us in – into his space/time – looking back, looking forward, looking around with open eyes/hearts.